I recently came into possession of three bags of dark chocolate Hershey Kisses. Lord, help me, they were buy two, get one free at Food Lion and I had a $1 off coupon. So 216 individually wrapped kisses later, I was trying to figure out what to do with them--besides eat them immediately. I made a batch of Rich's favorite Peanut Butter Blossom cookies, whose recipe promised to use 48 and only used up 24. Drat. So I made the Triple Chocolate Threat Kiss cookies, knocking off another 36 or so. Only 156 or so left, right? Then, my friend Jenna gave me the great idea of filling the tines on stainless steel wisks with kisses and attaching a note that says "We Wisk You A Merry Kissmas." Too cute and great teacher gifts. So I used 40 for 4 wisks. Are you keeping up with the math? Today, my sister, Rebecca, gave me another great/horrible idea to make these pretzel treats. WOW! I never knew I could eat so many kisses in one sitting. We made 85 of these babies tonight, using the last of our kisses. Phew. Wait a minute, you say. That doesn't add up. There are 31 unaccounted for kisses. Where did they go? I'll never tell. Now, hurry, Christmas, hurry! I've gained three pounds in as many weeks. If I keep baking I won't be able to fit into my brand new jeans. Preheat oven to 200'. Line a baking sheet with parchment or wax paper. Arrange pretzels and top with one Kiss apiece. Bake 5 minutes, or until the Kiss melts into the pretzel when pressed with the back of a spoon. Remove from oven and working quickly press toppings as desired into Hershey Kisses. Let cool before storing. Lincoln decorating sugar cookie trees. My kefir grains arrived in the mail last week, thanks to Marilyn at www.kefirlady.com. Here's a picture of what they look like. Kind of a yellowish cottage cheese curd. The instructions said the kefir grains will grow and if you get too many you can always eat them. So I gave one a try. Tasted like a chewy, yeasty dough but with a slimy texture. I know, Mom Hogan, this is really grossing you out isn't it? To get started, I poured 4 cups of milk over the grains, secured a light cloth over the top and set it out on my counter for 24 hours. What a huge difference from the powdered version! The first batch I made of kefir with cow's milk I used Yogourmet's powdered kefir starter. Part of the reason I'm using the kefir is because I'm lactose intolerant and the kefir is an inexpensive type of yogurt drink with lots of probiotics that's easy on the stomach. Well, over the course of a day I worked the quart of yogourmet's kefir into my diet. Not a good idea. I was sick for 24 hours because the powdered version didn't devour enough of the lactose sugars in the milk. With the kefir grains, I didn't have to boil the milk and within 24 hours I had kefir I could use right away. I have now had three quarts with no side effects, and I'm finding I really like the flavor. It's very mild, although the texture isn't as creamy. But I think the lighter texture is also because I'm using 1% milk versus the goat's milk I used for the hot cocoa recipe earlier. Haven't tried to make this into hot cocoa yet. I haven't drank milk since I was a kid. Now what am I going to do with all of those $2 Silk coupons you gave me Maridith? :-) I've been drinking the kefir straight with meals and also using it to replace both the soymilk and yogurt in my smoothies. The kefir grains from Marilyn also came with great recipes on how to use it to make sourdough, since the kefir beverage can replace the yeast in the recipe. So something else to try. Now the only problem I'm having is that my kefir grains are converting one quart of milk every day. I'm using 1% milk but that's still way more dairy fat than I'm used to and it will start to get expensive. I haven't figured out how to handle this. I put it in the fridge to slow it down but apparently that doesn't make the kefir grains very happy. So if anyone wants to buy freshly made kefir beverage from me, I will have a few quarts available each week. Bring your own container and I'll only charge you $2 a quart to cover the expense of the milk. I'm pretty sure that's much less expensive than you'll find it at Trader Joe's or Whole Foods. When the kefir grains start to double I'm happy to share those for free. I wish you could smell this picture. There's nothing like the smell of gingerbread baking in the oven. We started making these at Christmas a few years ago. We enjoy decorating them as a family and then give them away to friends and neighbors. This is our first batch this year and we made 25 or so gingerbread men and then 5 or 6 stars for us to eat. This year I used Royal Icing, which allows you to do all kinds of fun and fancy decorations and sets fast and quick. But really we do very basic things with our gingerbread men so next time I think I will stick with the old shortening icing recipe. I posted both below. The funny thing about decorating cookies as a family is how everyone's personality shines. Here are my cookies: cute, colorful, a little skimpy on the frosting maybe, but all neatly identical for gifting. And here are Rich's cookies: such an engineer. I like how he worked the NC State basketball player into the mix. When I pointed out that we were giving these away to other people he said I was stifling his creativity. Yeah, yeah, yeah. And then we have Lincoln's cookies: generous on the candy. Such a giver. Mommy piped the frosting on his, because the tip I used was too small and you had to really squeeze hard to get it out. The ones he decorated all by himself he got to eat. He was very happy with this arrangement. I know, I'm such a control freak. The next day, when the cookies were hard, I bagged them up with these cute bags I found at Michael's. The kids and I are going to deliver them this afternoon in our little red wagon to the neighbors. I love where we live but we don't see much of our neighbors. Must be lots of fellow introverts. I guess that's why we all chose to move to a neighborhood with acre lots. So this is a good excuse to say hi. 1.) Sift together flour, soda, baking powder. Set aside. 2.) Cream butter and sugar until fluffy. Mix in spices, salt, eggs and molasses. Add in flour mixture. 3.) Divide dough in half and form into disks. Wrap in saran wrap and chill in fridge at least 2 hours. 4.) Lightly flour counter and rolling pin. Line baking sheets with parchment. 5.) Preheat oven to 350'. 6.) Roll out first disk of dough, keeping the other in the fridge, to 1/4" thickness. Use large gingerbread men cookie cutters to cut out cookies and transfer to baking sheets. 7.) Bake for 8-10 mins. Let cool and decorate as desired. Combine all ingredients except gel paste and beat for 8-10 minutes until still peaks form. Add gel paste to change colors as desired. To thin, add water 1 Tb at a time. To make the frosting more stiff add powdered sugar. Freeze any extra frosting for later use. Blend all ingredients. Color as desired. Freeze any extra frosting for later use. Grandma and Grandpa Russell visited recently and left us with loads of fresh veggies from their garden, including this impressive specimen. After roasted zucchini and grilled zucchini, it was time for my favorite variation--chocolate chip zucchini bread. I had to spoon out some of this particular zucchini's seeds, which were as big as a pumpkin's, but then it shredded easily in my Cuisinart food processor. This one giant zucchini yielded 10 full cups. This recipe uses 3 cups of shredded zucchini per batch, which is great if you're swimming in zucchini in your garden right now. I also substituted some whole wheat flour for white flour and applesauce for oil. A double recipe made two loaves of bread and three dozen average-sized muffins. The finished product is dense but moist and soft. They also freeze and reheat well and are a great way to get little ones to eat their veggies. Ben, my baby, only has four teeth for chewing but refuses pureed veggies so these are great (I pick out some of the chocolate chips so he's not getting too much sugar). And I love them in the morning with a hot cup of coffee. I've got a couple dozen in the freezer now so will be enjoying them into this fall as the weather (hopefully!) gets cooler. 1.) Preheat oven to 350'. Grease two bread pans and line with parchment paper, greasing the parchment paper as well. Line with paper cups or grease three, dozen muffin pans. I prefer muffins over loaves since I can take just one muffin out of the freezer for myself instead of having to wait for a whole loaf to thaw. But loaves are nicer to give away to friends or to bring out for company. 2.) In a large mixing bowl, mix eggs, sugars, vanilla, oil and applesauce. 3.) Add zucchini to wet mix. 4.) In a separate bowl mix all dry ingredients minus chocolate chips. Add dry to wet mix in batches. 5.) Fold in chocolate chips with rubber spatula, scraping bottom and sides of bowl and beater as you work. 6.) Pour out batter into bread pans and muffin tins. 7.) Bake muffins 17-20 minutes. Bake loaves 45-50 minutes. 8.) When cool, turn out of pans. Freeze in bags or store in airtight containers a few days. Phew. Sorry it's taken me so long to get up such a simple recipe. Seems a little anticlimactic. If you had a chance to make pesto or see some in the freshly-prepared section of your grocery store here's a quick, easy dinner or lunch. I wasn't sure how Lincoln, my almost-five-year-old, would take to pesto, but he asks for green pasta for dinner three out of five nights. Which is good since I used up the rest of my basil in the garden this week to make more. This stuff is like gold though with the ingredients--fresh basil, olive oil, fresh grated Parmesan cheese and pignoli aren't the cheapest things in the store. Luckily, the flavors are so intense a little goes a long way. If you have some leftover grilled or rotisserie chicken from a previous meal, that would go great in here too. Wash grape tomatoes and toss in 1 Tb olive oil. Season with salt and pepper. Roast in the oven at 400' for 10 minutes or so, until they split and pop and start to darken. Remove from the oven. Toss the pasta in the pesto lightly to coat. Add the grape tomatoes and toss. Add feta cheese to taste and toss very lightly. Salt and pepper to taste. The last few years I've planted basil and I've always been disappointed...because I underestimate how much I'm going to want! You don't need a lot of ingredients to make food taste good when you have fresh herbs like basil on hand. And Lincoln will eat anything if it has fresh basil from the garden on it. In fact, I tell him some things are basil just because they're green to get him to eat them. I know, I know. You gotta do what you gotta do. That said, all good things must come to an end. With dry August heat and the leaves getting bigger (and therefore starting to tend toward bitterness), and some plants going to seed, I decided it was pesto-making season. So here's my recipe for making pesto. If you don't have 8 cups of basil leaves on hand, you can easily modify this to what you do have around. If you don't have pine nuts (also called pignoli on some labels), you can use walnuts, although I'd play with the ratios since walnuts to me can have a stronger flavor. You can also leave out nuts altogether. Toasting the pignoli ahead for just a minute or two until brown wakens their flavor and texture. Fresh lemons are best. Take care to wash your basil well since none of this is cooked and you'll be eating it basically raw. I found some interesting critters curled up inside my leaves. There are better ways to get your protein! Unless, of course, you're trying out for that survivor guy show. Recipes for what to do with your pesto will follow. 2.) Thoroughly rinse each stalk and leaf with cold water, removing damaged leaves and garden pests. 3.) Remove the leaves, discarding any of the woody stalks in a grocery bag with the damaged leaves and pests (I seal these up at the end and toss them in the outside trash so no little nature visitors surprise me in my kitchen later). 4.) Thoroughly dry by rolling in a clean kitchen towel, pinching together the ends and shaking out excess water. Use a second dry towel, repeating the process if needed. 5.) Meanwhile, lightly toast your pine nuts. You can also omit them or use walnuts. Juice your lemons and measure out your olive oil and cheese. Peel your garlic. 6.) Begin to pack as much of the basil into your food processor as you can, using the chopping blade. Pulse until you break down some of the leaves and can fit in all 8 cups of the basil. You can start adding the lemon juice and olive oil to help the process. 8.) Toss in all remaining ingredients and pulse until a smooth consistency. If it's too dry, add a LITTLE more oil, 1 tsp at a time. You can't go back once you add too much oil and in my mind there's nothing worse than oily pesto. 9.) To freeze, spoon the pesto into ice cube trays (each slot is about 1 Tablespoon of pesto). Cover with plastic wrap, pressing the wrap down into the pesto to keep it from discoloration or freezer burn. 10.) 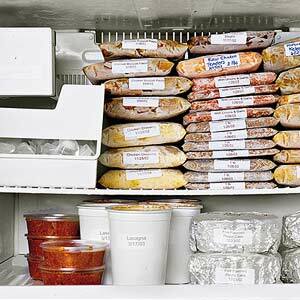 When frozen, turn out into a freezer bag, label and store away to use later. Makes about 18 Tbs. 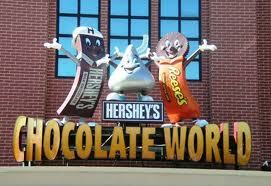 On a recent trip to visit family in Upstate New York, I took the boys on a side trip to Hershey, PA. Even though I grew up a few short hours from Hershey Park, I'd never been. I suspected that the amusement park itself would be too much--for the boys, me, and the budget. But then I read about Hershey Chocolate World and decided it was just our speed. If you're looking for a real factory tour, you'll be disappointed, but little ones will love it. I bet teenagers will get a kick out of it too, although they might not tell their friends. Also available besides the free tour: a 3-D adventure, Make-Your-Own Chocolate Bar experience ($15 a pop and they charge every member of your party), and a Trolley tour. All looked like fun for another day, especially for older kids. My only complaint was that they made us leave our stroller outside, and since I was on my own, it made it more difficult to get around. Note to the world at large: If you see a woman lugging a baby and a preschooler through a chocolate factory, hold the d--n door! Also, full disclosure: I believe very strongly that the only good Hershey bar is one served with roasted marshmallows and graham crackers, but the tour does make you feel good about supporting dairy farmers. Also, the animatronic cows seemed happy. I do have a soft spot for York Peppermint Patties and their dark chocolate bars with the nuts and berries. Both boys will apparently eat anything that starts with an H and ends with -ershey. I see many more stops at Chocolate World in our future. Maybe next time we're up that way we'll give the museum a shot (A shuttle will take you to the museum from the Chocolate World parking lot) or Hershey gardens. Lots of fun photo ops; smelled great; low cost; and we were back on the road in time to miss the morning commuter traffic. See you next year, Chocolate World! So, what's the book about? I can't tell you yet. Because I can't stop myself from talking about the cover. The first thing I thought when I saw the cover was, "Hey, wait, that's a chocolate frosted yellow cake. Who in their right mind would frost a lemon cake with chocolate frosting? Seems like a waste of perfectly good lemon cake...and chocolate frosting." Actually, the mom in this book does make such a cake for her daughter, Rose, for her ninth birthday. And when Rose tastes the cake she is awakened to an uncanny ability to taste her mother's emotions through her food. The book, set in Los Angeles, follows Rose's development as she learns to live with and finally embrace and use her strange ability. She eventually discovers, however, that she's not the only member of her family with special skills. 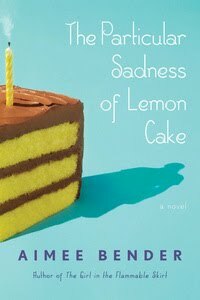 The charm of 'Lemon Cake' is not necessarily the exciting plot or sparkling prose. I confess to being a scanner, and I hit the FF button a couple of times during the first half of this e-book. (Life is short; don't waste it reading bad prose or dull story lines.) But as Rose grew, I became more interested in her life, her brother's strange disappearances, and her ever-so-slightly deepening relationship with her dad. Of course at one point I wondered if she only ate the food of very depressed, angry, annoying people. Apparently not many happy cooks or chefs or, for that matter, people in L.A. But by the final chapters, when my iPod died and I was still two hours from home, I found myself rifling desperately through the suitcase in the trunk looking for my charger. I even unplugged the kids' movie and listened to the whining and ranting for the last 30 minutes just so I could find out how it would end. And that, my friend, is the best compliment I can give a book. So, chocolate iced lemon cake...really? Any one? Am I alone in this?